Sailing Daily For Sea Bass Weather Permitting - Saturdays 6:30 to 3:30 @ $125.00 -- rest of the week 7 to 3 at $110.00. Lots of Limits so far..
Look forward to fishing every day possible..
17,461 Reef Blocks deployed at numerous sites: TNC's Restoration Reef 278 - Doug Ake's Reef 3,238 - St. Ann's 1,600 - Al Giles/OC RUST Reef 1,260 - Eagle Scout Reef 934 - Sue's Block Drop 262 - Nichols' Concrete 867 - Capt. Bob's Block Drop 676 - Benelli Reef 341 - Capt. Bob's Reef 423 - Wolf & Daughters Reef 210 ..
We are catching sea bass. Limited the rail one day & came close another. Lost opening day to a near-gale NW wind. Will be more of that, the losing days to wind; but a lot more of the catching too. Nice to be fishing again. I would never have dreamed I'd like DelMarVa's 15 cbass limit at 12.5 inches -- but it's the best deal going right now. A slow, smoldering battle since the 2009 emergency sea bass closure has been intensifying. It's not even been a battle really. NOAA's recreational catch estimates from MRIP pop skyhigh in one state or another, and that state suffers incredible new sea bass restrictions. No blows have been landed on NOAA/Council/Commission. No setbacks at all. Rec fishers bear all the losses. Three fish bag limits are not uncommon these days. Fifteen inch size limits are becoming normal. Such restrictive regs have, so far, been in states with scup/porgy fisheries & robust flounder/fluke fisheries. But, trust this; bad data cancer is creeping south. New Jersey anglers are in one heck of a fight for both sea bass & fluke. NY anglers may have weeks of sea bass season with a 3 fish limit. In much of that region, there is no fall-back for men in my business. Recreational access to sea bass is vital. I have tried to tell any who would listen that our region's sea bass are fantastically more productive recently. Growing swiftly: those fish will soon be legal. MRIP's knockout regulatory punch is their Statistical Outliers showing other-worldly new highs of catch. Paper & computer catch -- not real catch. Might not be real catch, but it sure becomes real regulation. When managers spy high estimates, they have to restrict catch. That's current policy ..policy being an agency's current interpretation of law. We have New York's Private Boats catching sea bass incredibly well. 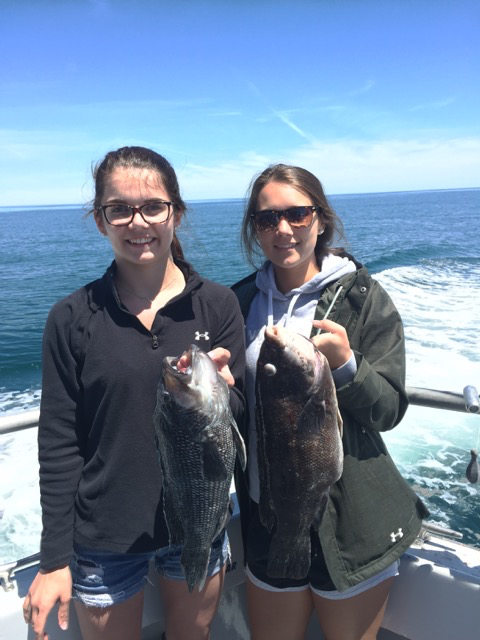 And they did too -- in Long Island Sound there is a wonderful population increase in sea bass. But MRIP's modus-operandi is to take a factual increase and strap it to a statistical rocket. That's why I've been working so hard, so long, to arrest this very bad habit of NOAA/Council/Commission in making draconian regulation because of bad catch estimates. Now our sea bass are on the uptick, (despite NOAA thinking their population's shifted north; that the Mid-Atlantic is now too warm,) soon our upswing will be in MRIP's sights. And we'll lose our sea bass fishery too. Recently I've been communicating with Party/Charter boats that fish the Hudson/E Long Island region Nov/Dec sea bass fishery -- trying to find out what other fishing boats they see on those early winter days. They all report very few Private Boats on most trips: None, or two. Like that. Everyone's inshore blackfishing, but especially targeting the late run of stripers. Lot of boats there - yes. Offshore chasing sea bass headed for the deep? No. Fishing exactly 200 miles south of Moriches in Maryland's somewhat warmer waters, I see about one Private Boat a week sea bassing in late fall/early winter. There were no errors in data collections, survey data obtained, or catch and effort estimation that would lead to inaccurate landings estimates of black sea bass in New York in wave 6, 2016. 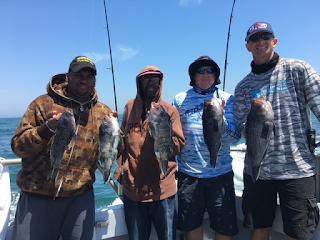 Rather, the apparent ubiquitous occurrence of black sea bass in the recreational fishery, and the higher than normal Private/Rental boat fishing effort in federal waters led to the unusually high estimated harvest of black sea bass during this period. They also report no Private Boats were over limit or possessed undersized sea bass. Here MRIP justified their Wave 6 data to Management. One would hope the For-Hire estimate shown here rather accurate. If that's the case, if the Party/Charter side is the more accurate figure--and it should be because professionals provide state & federal regulators with daily catch reports; then the Private Boat fleet is, by MRIP's calculation, responsible for 94.25% of NY's Wave 6 sea bass landings. Curiously though, the 2016 Wave 6 NY Private Boat sea bass shows quite nearly all the years from 1981 to 2015 being bested by 2016 alone - 35 years combined/added together would barely equal 2016's catch - that's smelly. NY's neighbor to the south takes their sea bassing equally seriously. Yet MRIP shows NJ Private Boats landing a more plausible 14.5% of that state's Wave 6 sea bass. Time after time in these shoulder-season estimates, & even in high summer, MRIP creates incredibly more Private Boat effort than actually exists. The guys who are out there report an empty sea -- empty of Private Boats at least. They tell of seeing more Partyboats -- big Partyboats; boats that once would have had numerous clients in Nov/Dec -- they see more Party Boats than they see Private Boats. So, with NY's 6 big partyboats that target sea bass in the late fall/early winter period seeing just two private boats a day, we can over-estimate the number of unseen boats and take a stab at how many pounds of sea bass they must have landed to achieve MRIP's number of 721,000 pounds of sea bass. We should also note that one 100 foot boat had scheduled 35 trips in the period and lost 11 to bad weather. That boat would be going in weather that might be fatal to a smaller outboard in early winter, but I'll include most of his days as 'fishable' for the Grady Whites & Boston Whalers. I'll also triple the number of Private Boats that were reported to me. Take the 720,891 pounds estimate and divide it by 792 trips (a high trip estimate) and each Private Boat landed 910 pounds per trip. My goodness.. At 2 pounds apiece, that would be 455 sea bass per-boat, per-trip. If a more realistic number of fishable days were used, (and these are offshore runs, not like hiding under the beach for striper or inshore toggin,) and if a number of boats more like what was actually reported to me was used, then 2 thousand pounds or so per trip would be required to achieve the MRIP estimate. But MRIP says there were no errors. Therefore, because actual catch requires actual boats, we can divide 287,170 by 10 fish limits, & divide again by 3.5 as an average number of anglers on a Private Boat trip for 8,204 Private Boat trips. Divide that by 22 fishable days, (my boat got 25 days in the period 200 miles south) and there were 372 Private Boats out and catching sea bass like mad every day a 100 foot boat could fish. Instead of 2 boats, each Party Boat should have seen 62 Private Boats -- every time they were out. MRIP must have a lot of good bottom up that way.. The highest Private Boat estimates were reported to me at DE's two offshore reefs. Even there in Nov/Dec, with sometimes close to 20 Private Boats on a pretty day; even there you'd find the number of anglers about equal or edging Party/Charter. If it's saucy, if the winds pushing a modest wave set, then Party/Charter anglers will outnumber by a lot. I have long argued first MRFSS & then MRIP recreational catch estimates were a poor substitute for hard data; that they should never be used as-is. I first noticed & wrote about bad recreational catch data in 1998 or 1997. My own complaints were certainly a small part of NOAA's & Congress's impetus to correct our data several times. Haven't had a satisfactory result yet. We must now encourage our representatives in DC to nudge NOAA toward more accurate recreational catch estimates -- we must try again. I guarantee all who will read: We Are Being Robbed. Entire Fisheries Are Being Stolen From Recreational Fishers By Bad Catch Estimates. Folks in DC are mighty busy these days. Gonna get busier I think. Still, this is their doing. It's NOAA's policy to use this MRIP data as is. Simply allowing debate at Council or Commission -- or better, developing a test to truth the data: either would take us to a more stable place in regulation. Write your state's fishery people. Tell your state reps what's going on. It's a sure bet they know key staffers in DC and their boss a dern-site better than you.. If you do not know your Senators & Congressman -- but rant away on Facebook -- you'll need to redirect some energy toward folks who could actually fix this. Once you get above fisheries level, don't try to talk to the boss. Instead, become acquainted with a staffer.. They're often young - but dedicated. A few staffers I've met are truly heroic, patriots in every sense. All are sharp. Some readers are going to write me saying I should list emails, or concoct a sample letter. Cut & paste letters carry little weight. Almost none, really. Hearing real thoughts from a real live voting constituent -- that carries weight. Use the google & find your reps.
Write. Snail Mail Is Always Best (until you get to know them.) But don't snail mail DC. Send mail to district offices because anthrax testing takes a long time. Ask your reps if they think this MRIP stuff makes sense. Call 'em too. Ask em why such terrible guesses at recreational catch should be used to destroy fishing's future. MRIP is gutting our industry.